I am Rachel Pohl. I'm an artist, adventurer, humanitarian, and environmentalist. I believe in fiercely pursuing a life outdoors, which is seen by some as perilous and improbably optimistic. I spend my time with friends and family, in wild places, and in the pursuit of creating artwork that will enhance our lives. 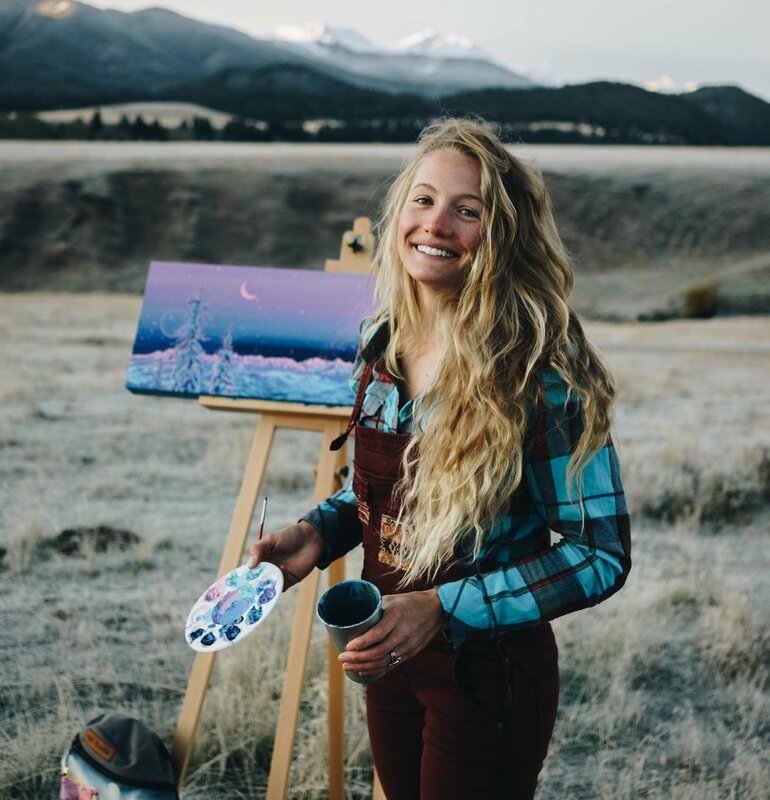 I paint acrylic landscapes, giant mountain murals, and little watercolors when I'm in the backcountry. I love hiking my acrylic paints around in the summer months as much as being cozy in my studio in the winter. For me, painting is as essential as breathing air and eating food. It is equally as powerful and even more meaningful than the flow state I find when skiing through powder, slashing my tires around loamy corners, or climbing to the top of a mountain. I am constantly drawn to explore places that make me feel alive. My work transports me to those overwhelmingly wild and beautiful places, and I hope they can do that for you too. My detailed and meticulous paintings are a reflection of who I am. I fill each and every day with a determination to do more, be kinder, help our planet, create, treat my body well, and smile as much as possible. I love empowering others, especially women, and encouraging them to get outside and out of their comfort zones. I want everyone to do that which makes them glow, because then we will all be better at facing life and treating ourselves and others as kindly as possible. I absolutely love sharing my view of this planet with all of you with my paintings, and words alike. Because you are reading this, you too care about artwork and following your passions. So thank you for reading and following along. But truly, having my work adorn people's homes actually brings happy tears to my eyes. I may not be changing the world in the ways I desire just yet, and I might not always accomplish every detail on my list, but knowing that there are so many people out there with a similar vision gives me so much hope for humanity. And we have to keep smiling for each other. The process of making prints is involved too but that's why I love it. My prints are made in Bozeman by my photographer friend Travis Andersen. Each print is hand trim and packaged. I use 100% recycled cardboard backing and mailers. I ask that you recycle the materials, including mailers, tubes etc., when the print has made its way to you. The other products in my store, from stickers to wallets, face masks to backpacks (coming soon) are all USA made by friends with small businesses. The environment is key to both our health and happiness and it means a lot to work with other companies who understand the importance of locally made goods, recycled materials, and not using more packaging than necessary. I appreciate all of you for supporting my work and thank you for being a part of your story. I am simply an ordinary human trying to do the best that I can, with an amazing support network that I rely on daily to make this career a reality. With my work and my life, I hope I can pay attention to all the details, but even if I don't, I am confident that my intentions + your awesomeness will make each day a little bit better.